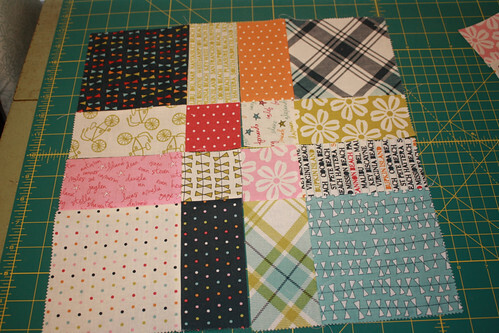 So here are my blocks for my January Swap. 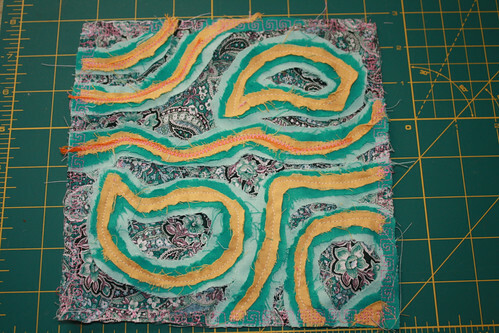 I actually picked this block out for my swap group – the organizer was looking for ideas, and I really had been wanting to play with this one for a while. The black, was not my choice – but I think it makes it kind of look vintage-y, particularly with my fabrics. The prints are kind of all over the place – I wanted them scrappy enough to be able to blend in with other people’s blocks – there’s some vintage fabrics, some modern and traditional prints, which I threw in there to kind of tone down the orange – and then there’s a couple of cheesy novelty prints ( Something promoting a Demi Lovato movie, and some Hannah Montana ) in there too just because I think its funny to throw them into scrappy projects. It’s going to be hard to let these go, I like them so much. 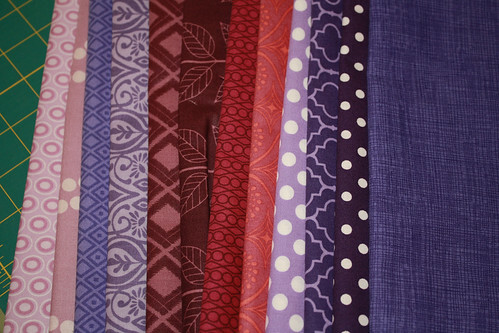 A few weeks ago I signed up for Pink Castle Fabrics’ Stash Stack Club. I had been wanting to sign up for a fabric club for a while, but I was really not wanting to sign up for anything that would be too cutesy or country or whatever some months. I wanted something useable. I think that this one is going to fit the bill just fine. Every month you get a selection of modern fabrics in a given color. This month was obviously purple, and I’m pretty pleased with my first selection. So after several months I’ll have a selection of prints that are more my aesthetic. Granted I love my very large stash of fabric, but because it was mostly gifted to me – a lot of it is fabric I would have never chosen for myself. 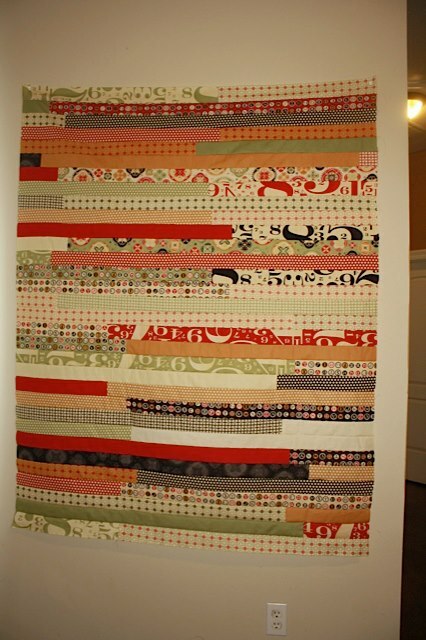 And while it does fine for scrappy projects, it’s very hard to make a more coordinated piece. 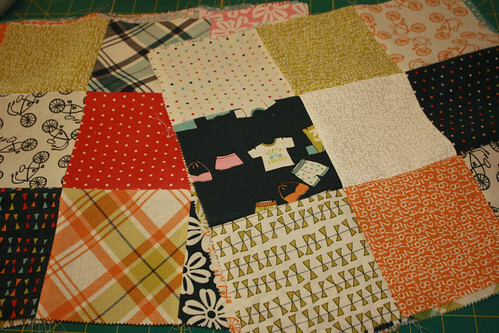 It will be also nice to have more contemporary fabrics to mix into what I have already. I am terrible at cutting. Just so terrible. Especially when it comes to the dreaded 2.5 inch strip. 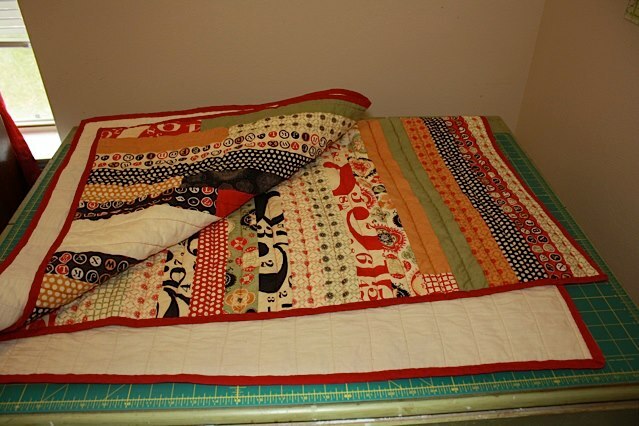 So I’ve been eyeballing die cutters for a while now and last week I took the plunge and got a Accuquilt Go! Baby starter set. I haven’t really gotten a chance to use it other than a few test cuts, but it’s awesome, and I’m excited. This is all! Or something Mostly its a very stressful time of the year. Workwise, things are INSANELY busy and stressful. Add on top of that the looming holidays and projects that need to be completed – AHHH! 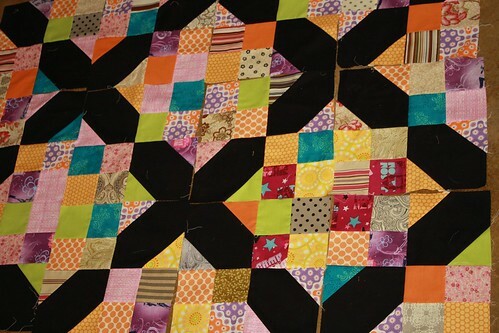 In any case, here is one of those aforementioned holiday projects, a hexagon lap quilt, in Chicopee. It’s coming together pretty quickly, and I love the prints. I’m using this super awesome tutorial from tallgrass prairie studio. Now that Halloween costuming foolishness is over and no longer taking up my studio space, I can finally get back to my projects. Yesterday I put a good couple of hours into working on my disappearing nine patch – I sewed the half-units together and pressed open all the seams so I’ll be ready to finish assembling them this evening. Thing I am proud of: I am getting pretty good at matching points. I only had a couple last night that weren’t pretty, and it’s nice to see progress in that area, since I’ve been struggling with it for a while. Thing I am worried about: I’m worried about the arrangement of the prints and contrast between all the pieces. I sewed all these pieces together without much forthought, and I know it is going to wind up biting me in the end. After I pressed all of these, I wants a change of pace, so I even sewed up a bunch of HST’s for my pinwheel project – so I got a lot of work done! It was bound to happen basically. I’ve been a pretty active swapper since the summer, and I hadn’t had a bad experience yet. Until now. 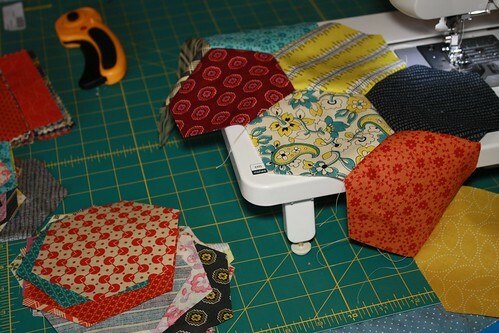 The swap itself I was excited about – scrappy hexagons! I love hexagons – and I could get enough to make some pillows out of or something. That would be awesome. My first package arrived from the moderator of the swap – they were perfectly made, and actually kind of intimidated me, because I wasn’t sure I would be able to accomplish the same level of skill. 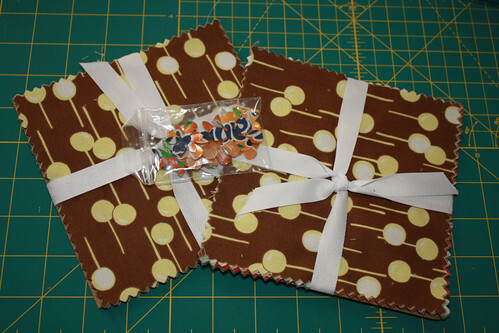 But my second package showed up, and proved that nobody was going to even bat an eye at my n00b sewing skills. It was not the right size. Nor were all the pieces hexagon even, look closely at that top left piece. I am not sure what happened here, honestly. But after you get something like that, it is really hard to send your pretty blocks out. 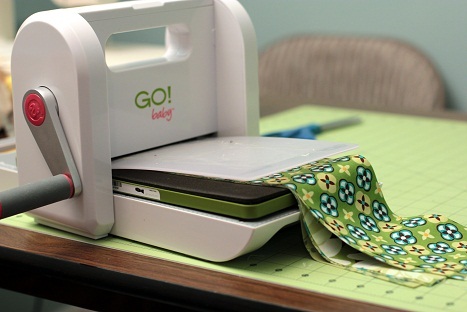 So right – I haven’t been blogging…but really its because I haven’t sat in front of my sewing machine in a couple weeks. 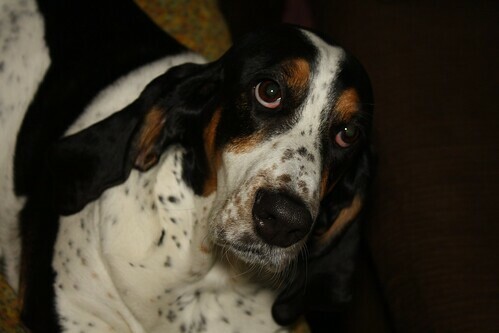 Work has been terribly busy, I’ve had a horrible head cold, and to top all of that off, one of my bassets got pyometra and had to have emergency surgery. Recovery has been slow, but she finally seems like she is back to her normal self, and she got her sutures out yesterday. I’m really going to try to get in the studio this evening, but it’s looking like its going to be a late workday. I have two tops that REALLY REALLY need to be assembled. Quite frankly I’m tired of looking at them. Wound up heading back and cut all of these out! Yay me! It’s been a while since I felt accomplished with my projects – I actually feel like I got a lot done this afternoon! First of all I got these very pretty charm packs in the mail today, I love when the mail man delivers presents! I got them cheap, and I think I’m going to put them in my future ottoman reupholstering project I’ve been daydreaming about. The fabric is Gypsy by Felicity Miller, and I really like it a lot. The big news though is that I finally finished assembling my 9 patches for my disappearing nine patch. I haven’t pressed them or anything yet, I really didn’t feel like it. 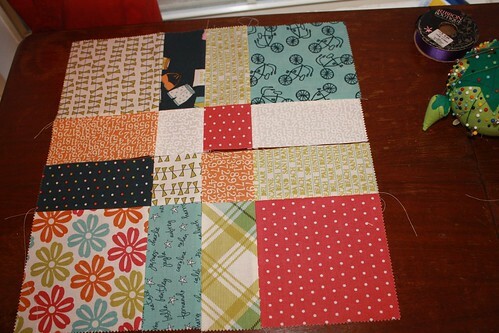 I also sewed ten units for my next class project, which is going to be a pinwheel quilt. So yeah! Sewing! I do it! I also made another one of those Stitch and Slash blocks, they are really fun!